Everyone needs a simple organization app. There are just too many random bits of information out there to rely on the sticky notes, snippets, and other hacks we all used at the dawn of personal computing to keep track of information. What’s compelling about Yojimbo, ironically, is that over time, relatively little has changed about the program’s clean interface, even as Bare Bones has added major improvements and enhancements such as sidekick, tags, and, in version 4, Mac-to-Mac sync. In fact, version 4 looks roughly same as the original release: the ultimate virtual file cabinet (or junk drawer, depending on your approach), with little bloat and a minimal upgrade learning curve. 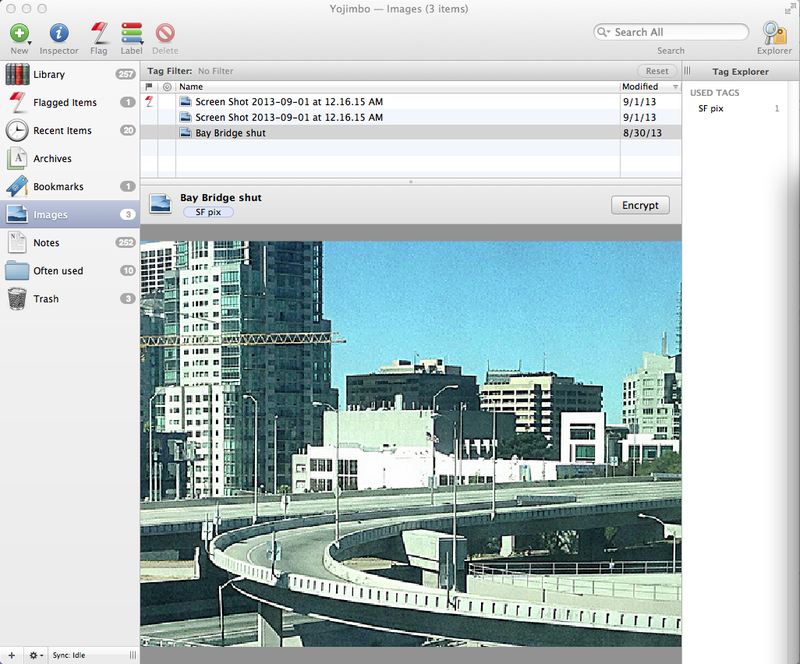 Version 4 also adds goodies such as a full-screen view and support for Retina displays. Yojimbo’s interface remains simple and easy to learn. The app is smart about where to place specific information, especially when you’re using the program’s Drop Dock or Quick Input panel. For example, Yojimbo knows whether a line of text or a string of characters is a URL or a serial number, automatically placing each in the proper smart folder. But you can also choose (as I did) to just dump everything in the main library and use the search function to find it later—the search never fails me. You can use tags or the search function to find items quickly. Bare Bones also offers a Yojimbo iPad app. This $3 app is essentially a read-only version of your desktop Yojimbo data that syncs over your local Wi-Fi network. The app works well as far as it goes, but would be much more useful if you could edit your data, and if it could sync using the new sync service, described below. Of course, a version for the iPhone would also be useful to have. The heart of this Yojimbo upgrade, and the major new feature in version 4, lies under the hood, in the form of a secure, over-the-Internet sync service that’s free to try for 30 days. 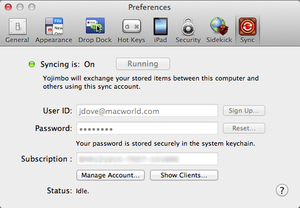 Early versions of Yojimbo offered syncing via Apple’s .Mac and MobileMe services. 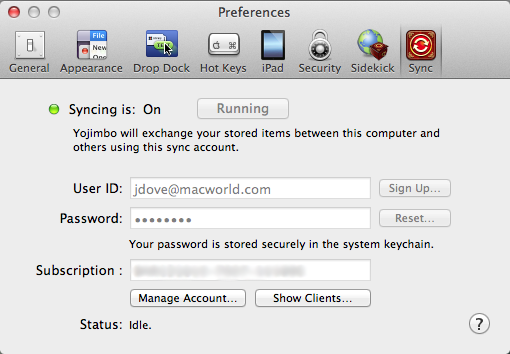 With the demise of those services, Yojimbo’s developers naturally tried—but ultimately failed—to take advantage of Apple’s iCloud for syncing. Bare Bones solved the sync challenge by instead employing Wasabi Sync, although this approach has introduced a new expense for the user (more on this in a bit). Yojimbo 4 syncs using Wasabi Sync, not iCloud. Once you get syncing set up, it should work as seamlessly as iCloud should have worked. (The setup process itself should also be simple, though I encountered problems due to a server glitch. Bare Bones told me this issue has since been fixed.) However, unlike iCloud sync, Yojimbo 4’s sync service isn’t free: It costs $36 per year ($3 per month)—more than the cost of Yojimbo itself. Bare Bones says it considered other pricing schemes, but the company felt it would be most fair to charge only the people who actually use Mac-to-Mac syncing, rather than shift the cost of syncing to customers who do not want or need the service. That seems like the right approach to me, and it makes Yojimbo reasonably priced for those who don’t need syncing (or who are technically savvy enough to devise other ways to accomplish it). Another change accompanies the new syncing feature: Because of Apple’s restrictions, Bare Bones can no longer sell Yojimbo in the Mac App Store. For those who purchased an older version via the Mac App Store, Bare Bones offers an alternative mechanism for buying the upgrade. 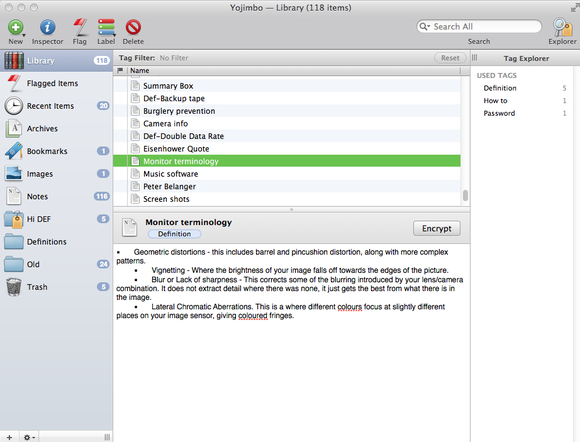 Yojimbo 4 adds a revamped sync feature, as well as full-screen and Retina-display support, to the venerable data manager, though if you don't need sync, Yojimbo 3 will still do fine.